A team of researchers including UCI project scientist Rachita Sumbria, Ph.D. and UCI neurologist Mark J. Fisher, MD have provided, for the first time, evidence that blood deposits in the brain may not require a blood vessel tear. The researchers found that brain endothelial cells, the cells that line blood vessels of the brain, have the capacity for engulfing red blood cells and depositing them outside the blood vessels and into the substance of the brain, without requiring a disruption of the vasculature. "It has long been believed that a tear or rupture of a brain blood vessel is the cause of cerebral microbleeds," said Fisher, a professor of neurology at the UCI School of Medicine. "While more confirmatory work needs to be done, our study points to an entirely new direction in efforts to eliminate brain bleeding and its consequences." The study, titled, "Brain Endothelial Erythrophagocytosis and Hemoglobin Transmigration Across brain Endothelium: Implications for Pathogenesis of Cerebral Microbleeds," was published in Frontiers in Cellular Neuroscience. Much of the new research, which was done in collaboration with the Keck Graduate Institute, was based in large part on previous work done by Fisher related to cerebral bleeds and how they are often an undetected cause of dementia and how they may develop after concussions. Bleeding in the brain, identified as cerebral microbleeds (CMB) on magnetic resonance imaging (MRI), are tiny deposits of blood in the brain that are associated with increasing age, cerebrovascular diseases, hypertension, and chronic kidney disease. 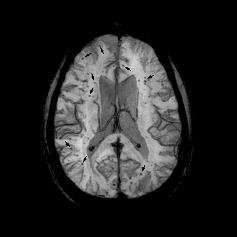 CMBs are a common cause of cognitive decline and contribute to risk of stroke. Using MRI, cerebral microbleeds are found in nearly 20 percent of people by age 60, and nearly 40 percent of people by age 80. Direct examination of human brain tissue samples shows that brain bleeding is almost universal by age 70.